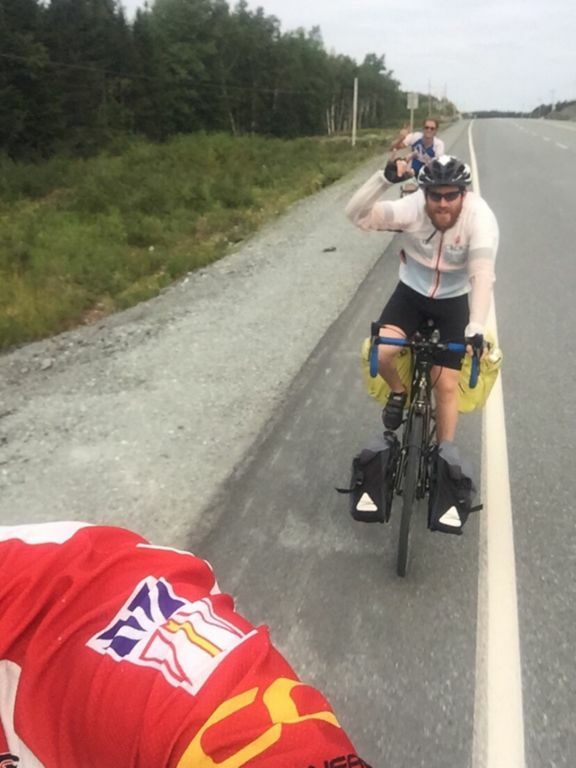 We had a fantastic final rest day in Gander yesterday with Rich and Paul. Got a little lake swim in, had some beers and burgers and coffee... a classic summer day! This morning we got an early start as we had a large day, and Rich decided to join us for the first 65km or so, then turn back and ride home, because he's a beast like that. He also did it fixed. After Rich left us at Splash and Putt, Newfoundland's premiere water park (sadly) we turned south, directly into the wind, and tackled the rolling hills of Terra Nova park. The temps were good, but in general today was a rough day. 150km, 1500m, and a headwind, are a tiring combo. This evening we're in Clarenville, which is about 200km west of our final destination. I saw the 200km market today actually. We're staying with another Richard, and his wife Rebecca, who made us a delicious dinner. Two more sleeps!